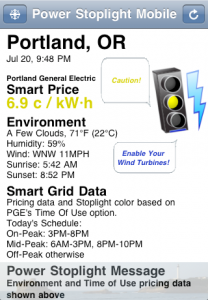 Browse: Home / Power Stoplight Mobile – Apps on iTunes & Android Market! 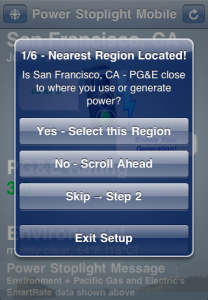 Power Stoplight Mobile is a Location & Grid-aware App that automatically finds the nearest electricity service Region in its list, then displays relevant information: whether it’s an optimal time or not for usage & generation of power, both environmentally and economically! 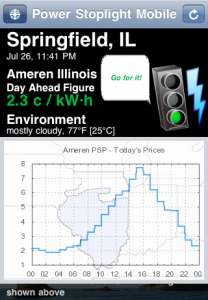 Power Stoplight Mobile for iPhone v1.10 is now available in the iTunes App Store! Improvements over v1.01 are in the user interface, specifically with improved graphics and map image selection for the different regions. Upgrades to v1.10 are free! Android users, fear not! 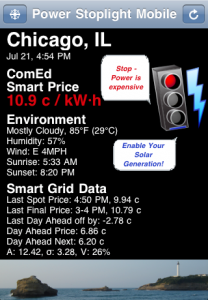 Power Stoplight Mobile v1.20 for Android can be found on the Android Market and has all the same features and functionality as the iPhone app. 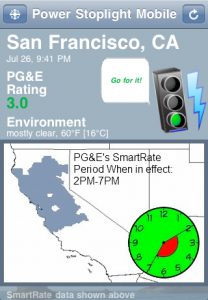 This new version has the added feature of GPS-sorting all regions, not just GPS-locating the nearest region from Power Stoplight’s region list. Power Stoplight Mobile is just 99 cents – it can help you save far more than that in a few days, both monetarily and environmentally. 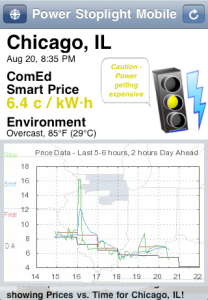 Additionally, some Regions’ images are now enhanced with price vs. time charts or Time Of Use clock displays (note that this improvement applies to the iPhone app v1.01 as well), making Power Stoplight Mobile a truly powerful analysis tool and adding to its overall fun-factor! 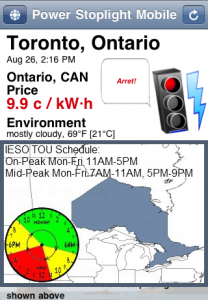 Follow the link above or search for the App in iTunes with keywords Power Stoplight.